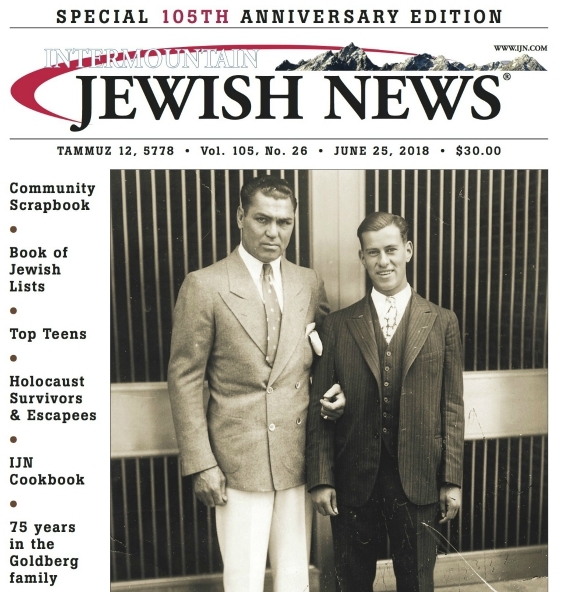 The Intermountain Jewish News is a weekly newspaper founded in 1913. It is an independent editorial voice, covering events in Colorado, New Mexico, Wyoming, Utah and Montana, as well as throughout the United States, Israel and Jewish communities around the world. The IJN is a much awarded newspaper, having garnered honors in news writing, features, profiles, arts and criticism, editorial writing, special sections and graphic design. The IJN publishes a special edition approximately once a month, including three magazines: L’Chaim magazine (fall and spring) and Generations magazine (summer). Other special editions include Education and Culture, Very Important People, Kosher Living, Jewish New Year, Passover, Chanukah, Dollars & Sense, Boulder, Home Issue, and Shavuous-Youth. Once every five years the IJN published a souvenir, large size anniversary magazine. The 100th Anniversary Commemorative Magazine was published June 24, 2013. Since 1943, the IJN has been owned and operated by the Goldberg family. The IJN gives voice to the vast array of voices in the Jewish community, and strives scrupulously to keep all editorial opinion out of the news columns. Its editorial page is independent and represents the opinions of the editorial board. Editor and publisher of the IJN since 1972 is Miriam Goldberg. Executive editor of the IJN since 1983 is Rabbi Hillel Goldberg, PhD. Shana Goldberg is assistant publisher. Editors and staffers with the IJN for 20 to 35 years include Larry Hankin, associate editor; Chris Leppek, assistant editor; Seiji Nagata, production manager; Lori Aron, account executive; and Andrea Jacobs, senior writer. Columnists include Tehilla R. Goldberg (New York) and Amy Lederman.